Most students have received an email or seen a flyer reminding you to apply for break housing before it’s too late, but what are you really signing up for? According to Tom Snee, the associate director of residential and commuter life, there are several criteria that make a student eligible to sign up for break housing. “Each break, we typically have, I would say, between 100 and 200 students who need to stay,” Snee said. Those who live in university townhouses or apartments have the most freedom in regards to break housing. According to Snee, utilities such as heating, plumbing, electricity, cable and Wi-Fi remain accessible over break, but student dining services are typically closed. “[Students] are on their own for their own meals,” Snee said. Students are meant to turn in break housing applications in about a month early, if any later, the fee per day goes up. If you do not live in a university owned townhouse or apartment, you still could be eligible for break housing. According to Snee, international students, students from out of state, students with an on-campus or off-campus job, and student athletes with required practices and events during break are all eligible. However, this does not change the fact that they will still be on their own when it comes to food, even if they live in a traditional residence hall with no access to a full kitchen. Those who apply for break housing because they have an on or off-campus job must submit proof of employment. “They need to submit to us a work document or work verification … that needs to be a letter from their employer saying, ‘so-and-so is working at this location on these dates,’ and we use that to verify that they’re actually employed,” Snee said. However, not all students who meet the above criteria are eligible for break housing. “If there’s a record of a serious student conduct violation, they’re not permitted to stay for breaks,” Snee said. Some examples of a serious conduct violation would be fighting, severe vandalism, or drug charges. Those worried about the cost of break housing will be happy to learn that in many cases, students are exempt from additional fees. 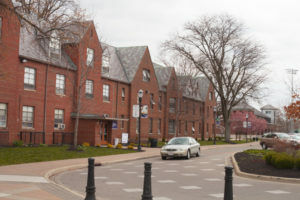 Students living in university owned townhouses and apartments, international and out-of-state students, and some student athletes are not charged for staying over break. However, those who do not meet those criteria are charged $15 per night, possibly more if their break housing application is turned in late. Even if they are not being charged, all students need to submit a break housing application. “We want to know, and need to know, who is going to be here at any given time,” Snee said. This is a safety precaution, to make sure that the university is aware of and can contact any student on campus during break in the case of an on-campus crisis or other major event. There are very few differences in housing policy during break as opposed to during the academic year. “The only notable difference, I would say, is that we don’t permit guests outside immediate family and students also approved for break,” Snee said. While most resident assistants go home for break, there is always at least one RA to help. “We do have at least one break RA who’s available to deal with lock outs or any situations that may occur, but it’s not the same as during the academic year … there is always a break RA who is available 24/7,” Snee said. The application deadline for winter break housing is Friday, Nov. 16. For even more information on break housing, go here.